Many have wondered whether Messi accidentally bypassed the boys before the game first round Group F against Bosnia, or he is became a "jerk"
Before the first game of Group F World Cup between Argentina and Bosnia in the tunnel before taking the field both teams shook hands with the judges. 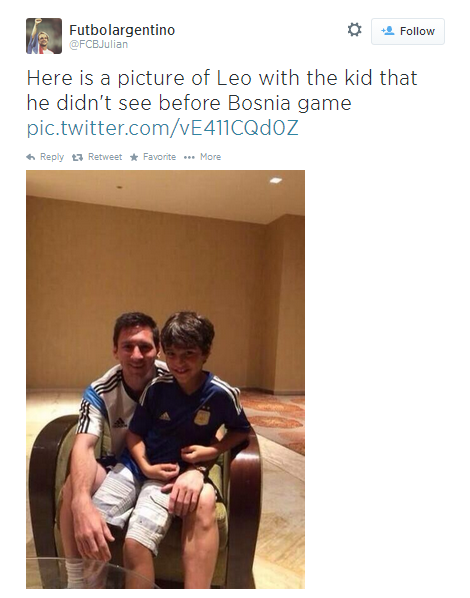 Many have noticed an interesting match in which Messi bypassed a boy he extended his hand to greet him. This video has toured the world and horrified the public, because we all know that Messi is "good soul" and a great humanist, but the public has condemned this move and unchanged opinion about the "little man but a great person." The snub occurred after Argentina's 2014 FIFA World Cup game against Bosnia and Herzegovina on Saturday, and Messi managed to track down the kid Saturday and snap a photo with him. It was a nice move on Messi's part, and the boy ended up getting much better moment than just a handshake. Al Qaeda attacked Tottenham because of Bale: "Greedy Jews, God will be punished you "